When it comes to giving your backyard chickens a home, it doesn’t matter the style of the housing — examples include a conventional chicken coop, an open range or an off-the-ground kennel — so long as you provide the basic requirements necessary for happy, healthy hens. In this guide, you’ll discover what to look for when building a chicken coop or buying a pre-made chicken house. The best chicken coops or poultry houses have several characteristics in common. The chicken coop should protect your backyard flock from hungry predators such as weasels, hawks and your neighbor’s Golden Retriever. The coop should be constructed of economical building material that’s easily available to you (not applicable if you’re purchasing a pre-manufactured cage or coop). It should be strong and sturdy enough to stand up against unfavorable weather, such as summer winds or winter snowstorms . The coop should provide your chickens with the right balance between enclosed shelter and open ventilation. It should be easy to clean and budget-friendly to maintain. The chicken coop should be big enough for your backyard chickens. Although there are hundreds of chicken coop styles on the market, most of these housing styles can be divided into two types: those that are portable and those that are permanent. 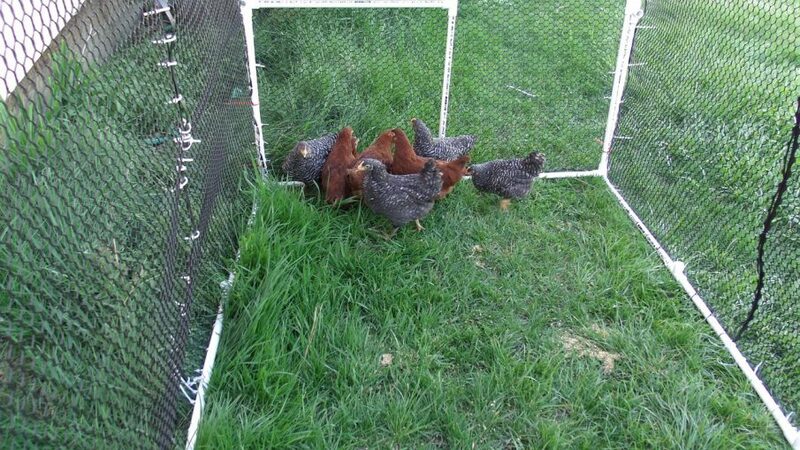 Portable coops typically don’t have a bottom and can be moved around a field or pasture to provide your chickens with fresh grass, bugs and seeds. It’s often known as the chicken tractor-style coop. Meanwhile, a permanent coop — think a traditional, colonial-style chicken house with an attached wire run — is designed to stay wherever you first build it and is best if you have only a limited amount of space for your backyard chickens. Your chickens want lots of space to run around and stretch their wings. The more space you give your chickens, the happier and healthier they’ll be. Generally, you should provide your backyard chickens with a minimum of 2 square feet per bird unless you’re raising bantam chickens, which only need 1.5 square feet per bird. Tempting as it may be, don’t cram more chickens into your chicken coop than the coop can hold. Overcrowded birds are more susceptible to health problems like cannibalism and disease. Happy hens love being able to see their friends around them. Proper lighting is important for your chickens’ sense of well-being. It’s also necessary to stimulate egg production in layer hens. Strategically placed windows in the south wall of your backyard coop will provide both natural sunlight, ventilation during the warm months and additional warmth during the cool months. You’ll also want to consider electric lighting, such as a bulb suspended above your chickens’ feeding and watering area, for the shorter fall and winter months. If you don’t setup sufficient ventilation in your backyard chicken coop, the air inside can become stale and stagnant. Besides creating nasty smells for both you and your pet chickens, this stagnating air can also create a buildup of unhealthy fumes. Prevent such problems by creating good ventilation, such as vents along the ceiling or small windows placed along the east or south side of your chicken house to create a fresh breeze. Think of a properly sized roost as the perfect mattress for your chickens. Your backyard hens will naturally want to sleep while perched off the ground on their roost. To give your chickens the best sleep possible, construct your chicken roosts approximately 36 inches or less off of the coop floor and space each roost approximately 14 inches or more apart. If you’re raising backyard chickens for their eggs, your layer hens will appreciate having a private place to go to lay their eggs. No one likes to do such business in public! Plan to have one nest for every three to four layer hens. Each nest should be properly sized, otherwise the hen will become stressed and may not use the nest. For optimal egg-laying, the nest should be 1.5 times bigger than your hens (this is breed-specific). A slanted roof over the nest is also ideal, as it will keep your chickens from standing or roosting on top of the nests where any falling manure can dirty your chicken eggs. I,ve been looking around the area for a coop for the girls so that i can move them out of my tool rm. and i,ve decided that i,m going to build my own . i found your sight interesting and encouraging thank you!!!! good post.one thing i woukd like to mention here is also to make arrangement to protect from predators as well.for this purpose we can have wire mesh around chicken coop. this is short interesting and to the point. it is well written, helpful and easy to understand. thank you!! !